Heat 6 tablespoons olive oil in a 12- to 14-inch sauté pan until smoking. Add garlic and fennel; cook, stirring frequently, until light golden brown and quite soft, about 10 minutes. Add red pepper flakes and continue cooking 4 to 5 minutes. 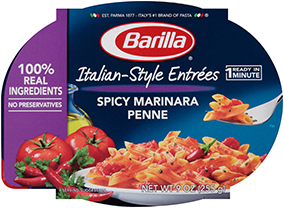 Cook Mostaccioli according to package directions and drain well. Pour hot Mostaccioli into the pan; add mint (optional) and ½ cup breadcrumbs. Toss to mix well. Transfer to a warm serving dish, sprinkle with the remaining breadcrumbs and fennel tops. Drizzle with remaining olive oil and serve with grated cheese on the side.